The December 2018 meeting will be Thursday, December 20th at the Elks, 1930 (7:30 PM). If you have anything to bring up let us know ahead of time, so things move faster. Click here for more information about the meeting location. This entry was posted in Meetings and tagged Christmas Party, Mid-Winter Conference on December 19, 2018 by VFW Post 879. The August 2015 meeting will be Thursday August 20th at the Elks, 1930 (7:30 PM). If you have anything to bring up let us know ahead of time, so things move faster. Click here for more information about the meeting location. This entry was posted in Meetings and tagged Buddy Poppies, Christmas Party, Color Guard Requests, Patriots Pen on August 20, 2015 by VFW Post 879. Christmas comes but once a year. Let’s get together for some holiday cheer! This entry was posted in News and tagged Christmas Party on November 24, 2014 by VFW Post 879. The October 2014 meeting will be Thursday October 16th at the Elks , 7:30 PM. If you have anything to bring up let us know ahead of time, so things move faster. Click here for more information about the meeting location. This entry was posted in Meetings and tagged Buddy Poppies, Christmas Party on October 6, 2014 by VFW Post 879. 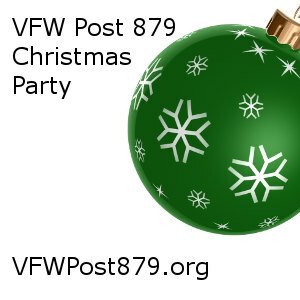 Final notice: If you have not signed up for the VFW Post 879 Christmas Party, please contact the commander or quartermaster by 9am Monday 2 Dec 2013. This entry was posted in News and tagged Christmas Party on December 1, 2013 by VFW Post 879. The July meeting will be Thursday August 15th at the Elks , 7:30 PM. If you have anything to bring up let us know ahead of time, that will let things move faster. Click here for more information about the meeting location. This entry was posted in Meetings and tagged Buddy Poppies, Christmas Party, Meeting Reminder on August 5, 2013 by VFW Post 879. The July meeting will be Thursday July 18th at the Elks , 7:30 PM. If you have anything to bring up let us know ahead of time, that will let things move faster. Click here for more information about the meeting location. This entry was posted in Meetings and tagged Buddy Poppies, Christmas Party, Color Guard Requests, Patriots Pen on July 5, 2013 by VFW Post 879.